This blogpost by Jo Ashline, on The Mom Blog, is one the my favorite posts I have read is a while. I feel lucky that my kids have lots of opportunities to interact with people who have special needs. I have had some parents tell me that they intentionally avoid play dates or classroom settings with children with autism because they don't want their kids to "learn autistic behaviors". While I recognize this is simply reflective of a lack of education on autism (you cannot learn, teach or fake autism), I feel sorry for their children who miss out on some fabulous opportunities that would come from interacting with children that have special needs. Check out what Jo Ashline has to say about this and then take a look at my personal experience in this arena. Being a part of the "autism family" in Utah, my kids have had the opportunity to have play dates with kids with varying disabilities.The night before "Light it Up Blue" for Autism Awareness my 3 sons and I spent the evening with my friend Katrena and her son Michael, who has non-verbal autism. 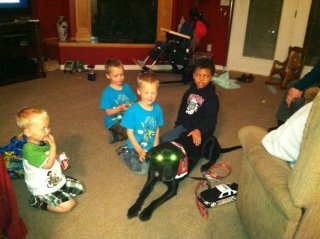 Michael showed off his service dog and gave my boys a tour of his room. They crashed trucks together and played with toys. They shared some snacks and played with each other brilliantly while the momma's chatted. Most of that play date you wouldn't be able to tell which kids had disability and which did not. When we left that night (after my boys begged to stay longer) I expected them to ask about Michael's wheelchair or his service dog or his lack of words. I was prepared to give them a great teaching moment about how everyone is different and it's so important to include them. The teaching moment came, but I was the student. As we backed out of the driveway with Michael waving good-bye to us, my 5 year old Mason said, "I like him. We should play with him again." My boys talked about how awesome Michael was all the way home. Not one thing about his disability was even mentioned - because it didn't even cross their minds. It just simply didn't matter to them or even occur to them as something warranting discussion. 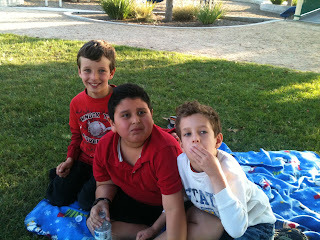 Instead, they talked about all the cool things about their new friend and asked when they could play with him next. My idea of teaching them to accept children with disabilities was based on the faulty assumption that they would naturally shy away from someone with some noticeable challenges different from theirs. I learned that a more realistic assumption is that young children naturally accept and embrace diversity until the world teaches them to do otherwise. When children are given opportunities to make friends with children with special needs, the process of the world teaching them that "different is bad" and "conformity is necessary" is stifled and their natural childlike acceptance of others becomes a part of the fabric of their souls. Conner (3), Jaden (5), Mason (5), Michael (9) having a fun time on their play date.